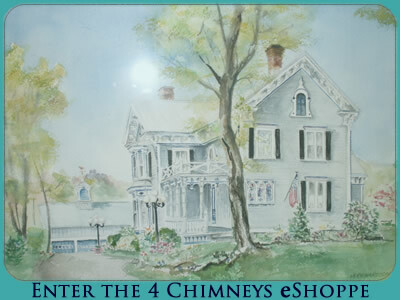 4 Chimneys eShoppe at Soltys, Inc. Since the home was built in the South, bringing cool air throughout was an important consideration, with a front to back grand hall with side windows beside the double door entry and transoms above all doors in the house. Large verandas on the front and back of the house keep the direct sun and summer heat out as well and provided pleasant areas for reading, enjoying coffee and socializing. As you enter the eShoppe through gardens designed to provide color in all four seasons, the leaded glass front doors open to welcome you into the grand hall. You can see directly through the house to the back veranda. A stairway hugs the walls up to the third floor and is open in the middle. The rooms on the right were used primarily for the family and those on the left for entertaining and business gatherings. The left side was more formal in décor than the right. Double doors to the right lead into a room that in its day was the family parlor with the round music room in the corner, wonderful wood work and a fireplace. The room behind was the family library and reading room. It most likely served as a place to serve the family more casual meals. On the left, there is a mirror image of the family parlor with more formal appointments and a rounded room that could be used for entertaining. The room directly behind the parlor would have been used as a combination library, office and gentlemen’s smoking room. The kitchen and the formal dining room were at the back of the house. The kitchen was on the right and the dining room on the left. Each of these featured windows set into a curved wall, bringing in lots of light and providing ventilation. It would not have been unusual to have a separate kitchen, outside of the house, where most of the cooking would have been done, both to control heat and limit the fire hazard. All rooms in the house are generous in size each with a character reflecting the personality of the past owners. At the back, there is a carriage house that is also three levels and is connected to the house and veranda with a trellised walk way. We have been working hard to get the 4 Chimneys eShoppe ready to open, and we'll be opening one room at a time. As rooms are built out and items added, we will also shift things around a bit, primarily using the first floor and carriage house. On February 1st, 2012 we opened the Formal Library which features Pat’s Bookshelf, with selections relevant to people in leadership and management positions. These selections have been carefully chosen from the full Soltys library which has over 3,000 books. To round out the month of February we're opening one of two music rooms - Mallie's Music Room, allowing you the opportunity to add to the soundtrack of your lives. As we open more rooms, music, art and other items will be added in one of the parlors. One media room will be specifically dedicated to Internet Initiatives and Social Media. Another multimedia room will feature customized items and recorded webinars. The dining room will act as our group discussion and meeting room, with ongoing discussion and scheduled exchanges. You can join us for a cup of coffee in the kitchen, which will also house our casual reading area and hobby items. The plan for the carriage house will be tools and technology. It will be a lot of fun to open each room and guide you through the selections and options as we continue to build offer entry to the Four Chimneys eShoppe.